Source: Flents Products Co., Inc. THESE ARE A PREMOISTENED TOWELETTE THAT IS INDIVIDUALLY WRAPPED. 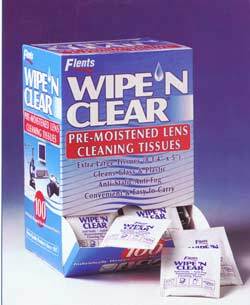 THEY ARE SPECIALLY FORMULATED TO CLEAN BOTH GLASS AND PLASTIC LENSES. IT IS AN ANTI-STATIC/ANTI-FOG LENS CLEANER. Flents Products Co., Inc., 5401 South Graham Road, Saint Charles, MI 48655. Tel: 517-865-8221; Fax: 517-865-8156.